The Extension Board is perfectly designed for continuous and heavy usage. Connect more than 6 devices at a time. Made of top quality material to perform long. If you use lots of electric devices then one wall socket is not enough for you, you need an extension board. If your charger cord is not long enough and you want to use the device at some place far then you can purchase an extension board. But you have cell phones, iPad, laptop, camera and flat irons, hair dryers and many other devices need to plug outlet and charger. Then this a MUST HAVE HOME ACCESSORY will triple the available outlets. The usb power strip can be easily plugged into a grounded outlet for regular or portable use. 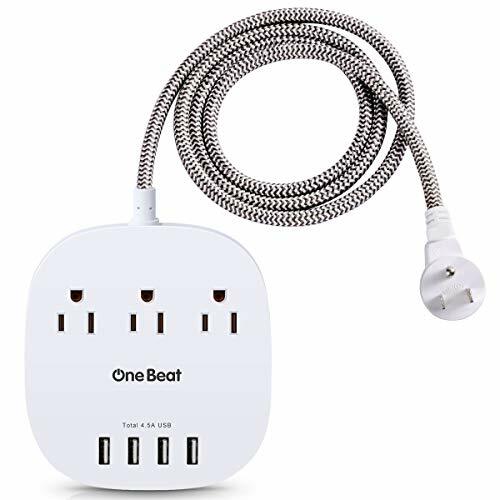 CHARGE FOR ALL – 3AC outlets and 4 smart USB charging ports desktop power outlet for electric devices, It support 7 electric devices simultaneously. like cell phones, iPad, laptops, lamp,cameras and many other devices. Travel/Home Charging Station- Comes with NO SURGE PROTECTION , it’s absolutely a must have Travel and Cruise Ship accessories as Cruise lines require that power strips DO NOT have Surge Protection. FAST & SMART CHARGING – 4 USB charging ports total 4.5A. Build in smart charging technology, This power board can auto-detect your devices and seek to maximize the fastest possible charge speed( 5V/2.4 Max Each Port ). Ultra-Convenience – 5 Ft braided extension cord, get easy access to place that’s hard to reach, extend the portable power strip to table or other place easily where need power outlets or usb charging ports simultaneously , you still can play your iPad or video game when charging. Support Guarantee – Best customer service by OneBeat : 90-day no-hassle refund guarantee, worry-free 36-month warranty. 24h*7d technical and friendly customer service supported.